Zhiyun Crane 3 LAB takes gimbal design in a different direction with the addition of a handle on top. With an included mini tripod attached on the bottom and this fixed, ergonomic handle on top, the Zhiyun Crane 3 LAB can be used two-handed for optimal stability. Moreover, the handle enables you to seamlessly switch to underslung mode, whether with one or two hands, and achieve creative shots such as 360° roll shots as you move closer toward a subject. In addition to this innovative design, the Zhiyun Crane 3 LAB also packs other advanced features, such as wireless video transmission, and provides the ability to stabilize up to 10 lb loads. The Zhiyun Crane 3 LAB supports two optional servos at the same time for focus and zoom control directly from the handwheel on the side. At the same time, all the other controls you need are provided at your fingertips at the top of the handle along with an OLED status screen. Additionally, the included ZY PLAY iOS/Android app (free download) provides many of the same control functions as well as special features such as panorama, focus time-lapse, motion time-lapse, long exposure time-lapse, camera settings, and more. Wireless transmission is achieved via a Wi-Fi connection to an iOS/Android phone or tablet. The Zhiyun Crane 3 LAB wirelessly transmits your video recording from your camera to your mobile device in real time in 1080p resolution. This feature is compatible with select cameras; please see the Zhiyun-Tech website for a full camera compatibility list. 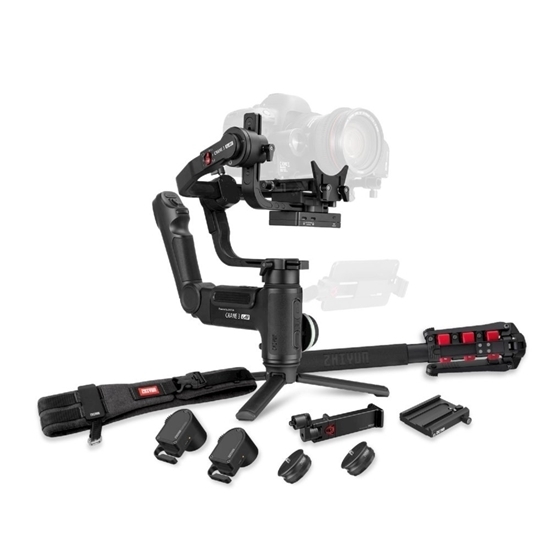 In addition to the accessories that come standard with the Zhiyun Crane 3 Lab, such as a mini tripod, the Creator Package also includes a quick release baseplate, telescopic monopod, focus/zoom servo kit, two quick setup adapters, a phone holder, and a multifunctional camera belt in size large. The servo kit consists of the Max and Lite motors for the Zhiyun Crane 3 Lab. The Crane 3 Lab supports two motors at the same time, so both can be mounted to control focus and zoom. The Quick Setup Adapters let you attach the mini tripod or monopod to the bottom of the gimbal by quick release functionality, instead of having to screw it in each time. And the phone holder will hold your smartphone on the side of the gimbal for monitoring. It supports up to 6.3" phones and can be articulated forward and backward as well as folded up when not in use.